I am Professor of Algorithms and Complexity at the School of Computing Science in the College of Science and Engineering at the University of Glasgow. My research interests lie mainly in the field of Algorithms and Complexity. That means that I am interested in the design and analysis of efficient algorithms, and proving results about the extent to which a problem can be solved optimally or approximately using an efficient algorithm. I am most interested in designing algorithms for matching problems, which involve allocating agents to commodities (e.g., junior doctors to hospitals, students to projects or kidney patients to donors) in the presence of "ordinal preferences" (e.g., a junior doctor might have first, second and third-choice hospitals, etc.) or "cardinal utilities" (e.g., real-valued weights that model the benefit of a kidney patient being assigned to a particular donor). The aim of a matching algorithm is to find an allocation that is optimal according to these ordinal preferences or cardinal utilities. A list of my publications and papers is available. I am a member of the Formal Analysis, Theory and Algorithms (FATA) research section in the School. 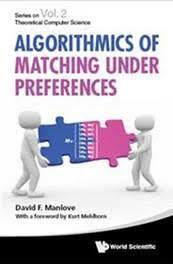 Book: "Algorithmics of Matching Under Preferences". The print edition is available to buy from the publisher or via Amazon.co.uk or Amazon.com. The e-edition and Kindle edition are also available to purchase and some sample material is available to view for free. EPSRC grant EP/P028306/1 , IP-MATCH: Integer Programming for Large and Complex Matching Problems (University of Glasgow principal investigator). Joint project with University of Edinburgh (grant EP/P029825/1: Sergio García Quiles, principal investigator; Jacek Gondzio and Jörg Kalcsics, co-investigators). 1 Nov 2017 – 31 Oct 2020 (£802k; University of Glasgow share £353k). 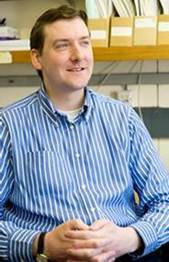 EPSRC grant EP/K010042/1, Efficient Algorithms for Mechanism Design Without Monetary Transfer (University of Glasgow principal investigator). Joint project with University of Liverpool (grant EP/K01000X/1: Piotr Krysta, principal investigator; Giorgos Christodoulou, co-investigator; and Paul Goldberg, co-investigator). 6 June 2013 – 5 June 2016 (£599k; University of Glasgow share £269k). NHS Blood and Transplant, Optimising options and strategies for living donor kidney transplantation for incompatible donor-recipient pairs (co-investigator). 1 January 2012 – 30 June 2013 (£151k). EPSRC grant EP/E011993/1, MATCH-UP: Matching Under Preferences - Algorithms and Complexity (co-investigator). 1 June 2007 – 30 June 2010 (£324k). Royal Society of Edinburgh / Scottish Executive Personal Research Fellowship, Efficient Algorithms for Matching Problems. 1 October 2003 – 30 September 2006 (>£100k). EPSRC grant GR/R84597/01, Algorithmics of Stable Matching Problems with Indifference. 1 October 2002 – 31 March 2006 (£63k). Please contact me if you are interested in undertaking research in the area of Algorithms and Complexity. Some potential PhD projects are listed here, and procedures for making an application are detailed here. Algorithmics II (H) (Hons / MSc elective, Semester 1). Course materials can be found here. Web Application Development 2 (Level 2 course, Semester 2). Course materials can be found here. Algorithmic Foundations 2 (tutorials and preparation of course materials). Algorithmics 3 (lectures, tutorials and lab sessions). Java Programming component of the MSc/MRes CS+ induction week. Programming (lectures, tutorials and lab sessions). Level 3 team, Level 4 individual and MSc individual projects. serving as Level 4 year head. membership of the School's Learning and Teaching Committee. representing the Department on the Faculty of Information and Mathematical Sciences Library Committee. Aug 1986-Jun 1992: Attended James Gillespie's High School, Edinburgh. Oct 1992-Jun 1995: Read for the BA in Mathematics and Computation at St Hugh's College, University of Oxford. Oct 1995-Jun 1998: Research for a PhD in Computing Science, University of Glasgow (supervisor: Dr Rob Irving). Oct 1998-Sep 2000: Research Assistant in Computing Science, University of Glasgow, working on the EPSRC-funded Stable Matching Algorithms research project. Oct 2000-Jul 2009: Lecturer in Computing Science, University of Glasgow. Oct 2003-Sep 2006: Held a Royal Society of Edinburgh / Scottish Executive Personal Research Fellowship. Aug 2009-Jul 2018: Senior Lecturer in Computing Science, University of Glasgow. Aug 2018-: Professor of Algorithms and Complexity, University of Glasgow. I stay in Linlithgow, a town in West Lothian. Page last updated August 2018. Page created by Sofiat Olaosebikan.